Marek Hamsik is a Slovakian professional footballer who plays as an attacking midfielder for Seria A club Napoli and the Slovakia national team. He is also the captain of Napoli, whereas vice-captain for his national team. He is the all-time top goalscorer of his club Napoli. Hamsik started his football career from Slovan club Bratislava in 2004. The same year, he joined Italia club, Brescia. In 2007, newly promoted Seria A club Napoli signed Hamsik. For Napoli, he has won two Coppa Italia, a Supercoppa Italiana. He also helped his team to qualify for UEFA Champions League and reached 2014-15 UEFA Europa League semi-finals. Hamsik also helped his country to qualify for World Cup at 2010 FIFA World Cup for the first time in their history. The 31-year old midfielder, Hamsik has been named the Slovak Footballer of the Year six times. He was also named Seria A Young Footballer of the Year 2008 and was included in Serie A Team of the Year in 2011, 2016 and 2017. Bloomberg ranked Hamsik as the eight best footballers in Europe in 2013. His creativity, skill and goal-scoring ability. Slovakian professional footballer who plays as an attacking midfielder for Seria A club Napoli and the Slovakia national team. Marek Hamsik was born on 27 July 1987 in Banska Bystrica, Slovakia. He holds Slovak nationality. Hamsik started youth football career from Jupie Podlavice. He then joined youth team of Slovan Bratislava. In 2004, just at the age of 17, Seria A club Brescia signed this young talent for a transfer fee of 500,000 Euro. At the end of the season, Brescia relegated from Serie A. Hamsik played for Brescia in Seria B for two more seasons. Another Serie A club Napoli signed Marek Hamsik on a five-year contract on 28 June 2007 for a transfer fee of 5.5 million Euro. Napoli was a newly promoted Serie A club then. Hamsik made his competitive debut for Napoli against Cesena on 15 August 2007. 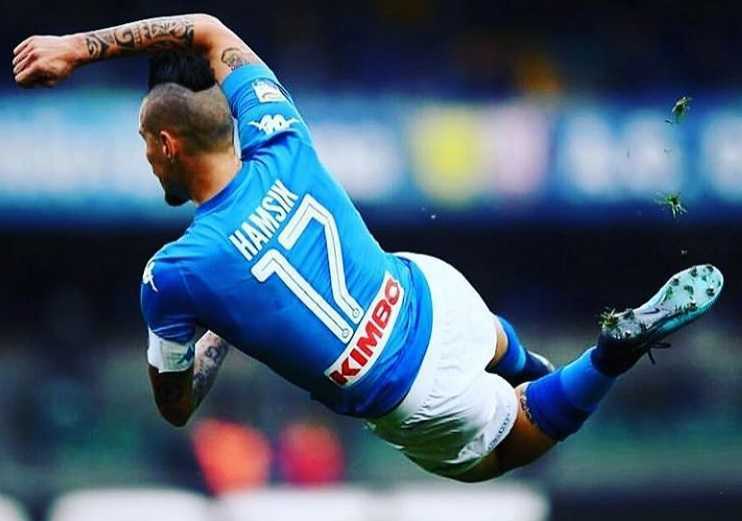 Hamsik scored his first goal for the club in his debut match. Hamsik scored his first Serie A goal against Sampdoria on 16 September 2007. Hamsik finished his debut season at Napoli as club's top scorer with nine goals. Hamsik was voted the best young Slovak footballer and the second-best Slovak footballer of the year in 2007 and 2009. Hamsik again finished his second season at Napoli as club's top scorer. Hamsik helped his team to earn a place at UEFA Champions League finishing third in Serie A in the 2010-11 season. Hamsik surpassed Antonio Juliano as the club's record appearance holder in European club competitions, making his 40th appearance for the club on 20 October 2014. Hamsik lifted the 2014 Supercoppa Italiana as Napoli's captain on 22 December 2014 defeating Juventus on penalties. Hamsik surpassed Diego Maradona as the club's all-time top scorer scoring the 116th goal for the club in December 2017. Hamsik has represented Slovakia at different age levels including Slovan U17, U19, and U 21 teams. He made his senior team debut in a friendly against Poland on 7 February 2007. Hamsik became a key player when Slovakia qualified for the 2010 FIFA World Cup. It was Slovakia's first World cup ever in their history. Hamsik represented Slovakia as a captain and reached Round of 16, where they were beaten by eventual finalists the Netherlands. Hamsik also became a key player of the Slovan team when they qualified for Euro 2016 for the first time. Marek Hamsik tied a knot with Martina Franova in July 2014. The couple has three children. They are living together happily. Marek Hamsik has become one of the successful key players at Napoli. 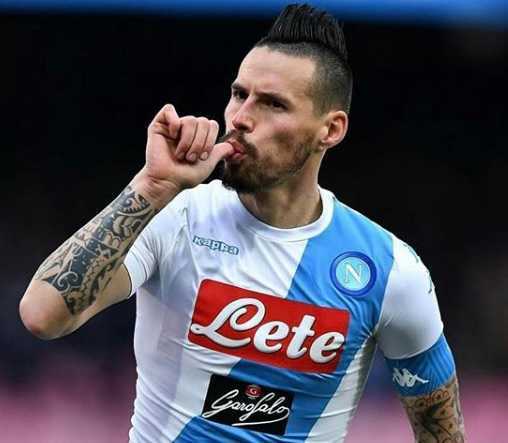 Knowing his importance at the club, Napoli has signed several contract extensions with the 31-year-old midfielder Hamsik. He was signed by the club on 28 June 2007 for a transfer fee of 5.5 million Euro. The net worth of Marek Hamsik for 2018 is still under review. Hamsik's football icon is Czech midfielder Pavel Nedved and Hamsik's playing style is often compared to Nedved. Hamsik surpassed Diego Maradona as the club's all-time top scorer scoring the 116th goal for the club. Slovakia defeated defending champions Italy 3-2 in Group Stage and reached Round of 16 in their first World Cup.